The future. Humanity has long since slipped its moorings to its own planet and now travels around the solar system quite comfortably. Travelling to a distant constellation is as simple as riding a bus to work, or catching a plane. And as the Doctor will soon discover, can be just as dangerous. 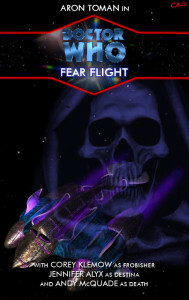 The colony worlds of Xanetu and Zatrius are at war, and Earth will not tolerate an interplanetary war on its doorstep. Travelling to the constellation of Pegasus to organise peace is Liam McKinley (MP), possibly the last chance to settle things down between the warring worlds. But there are those who don’t want peace. Those who feel this war must begin, and Earth shouldn’t interfere. Those that would do anything to prevent Earth getting involved. A lesson the passengers of flight #3932 will soon learn. Episode 3 (15.5 MB) 3 August 2005 21 min 57 sec. Doctor Who © British Broadcasting Corporation.